Company culture, work-life balance, management and benefits are more important now than ever before when you are on a job hunt. That’s why, along with GamesIndustry.Biz, we’re happy to present the winners of the 2017 Best Places To Work Awards. 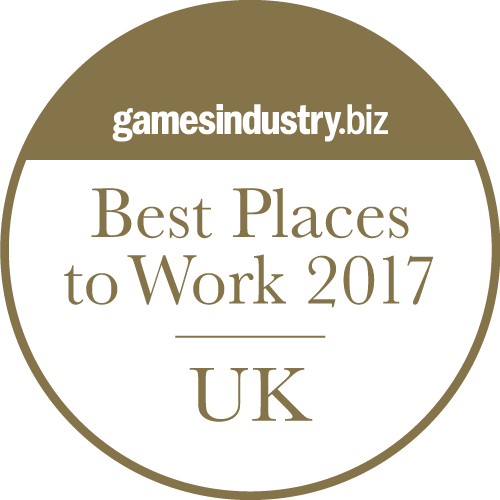 As voted for by the staff who work there, these are the games studios which will go the extra mile to keep their employees happy. You’ll enjoy everything from flexitime to profit shares and duvet days, and work in tight-knit teams where everyone’s voice is heard. With higher than industry average staff retention, you can be sure that you’ll enjoy working with any of these studios. The best part of all this? They’re hiring! Take some time to learn about our winners, what led them to victory and most importantly, who they’re hiring. Brighton's Wish Studios have been listed as one of the best small studios to work for and it's easy to see why. The critically acclaimed independent studio has a strong focus on creating a friendly and inviting company culture with a great work-life balance. Wish has established itself as a studio built on creativity and quality that really values the contributions of its team. Playground Games in Leamington Spa earned one of the highest scores across all studios, with a generous offering of perks and benefits for all employees. As well as keeping its own internal checks to improve staff happiness, one of Playground's most notable perks is an uncapped royalty scheme on the games produced by the studio. For a studio producing hits like the recent Forza Horizon 3, this means staff can directly share in the success of their work and even double their salary. With a professional, fun and supportive working environment, d3t have asserted their place on the Best Places to Work listing with one of the best staff retention records in the industry. Their variety of projects, anti-crunch mentality and mentoring ethos bring out the best in the team, and their dedication to continual improvement shows a great outlook for future progression.